Blurb: Growing up in a small Northern Arizona town, Faith Cloudfoot’s life was spent playing in the forests surrounding her house under the protective eyes of her father, and learning about the legends of her Native American heritage. “Good morning,” he said quietly. When she didn't answer, he wondered if she could hear him over the pounding water in the shower. He looked down at her small hands resting on his stomach and felt an ache in his heart. The thing actually hurt, and he wondered if this was what it felt like when people said that their heart was broken. His actually felt like it had shattered into a million pieces, and he had no idea how to get it back together and properly functioning again. After a moment, he slowly turned to her and kissed her deeply. Her brown eyes stared up at him, her hair falling all around her shoulders. He loved that hair and couldn't imagine never seeing it again. “Can I ask something of you?” he whispered. “Can I wash your hair?" 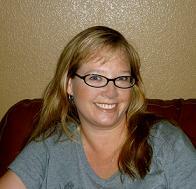 About the author: Carly Fall lives in Arizona with her incredibly supportive husband, their son and their dog. Giveaway: The author is giving away 2 ebook copies of Book One: The Light Within Me to two separate winners and one other winner will receive an ebook set of both books: The Light Within Me and Finding My Faith (for a total of 3 winners). Enter below. This tour is hosted by Bewitching Book Tours. Hi Carly. When you were writing Finding My Faith, how did you know what Rayner would look like in his alien form? I'm very intrigued with this series. Thank ever so much for the giveaway. I would love to read this book.